Are you looking to build your wealth with real estate? With the current state of the economy, this is a GREAT time to be buying, one of the best opportunities in years. 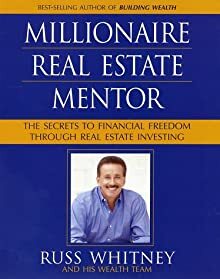 Here's one book that has lots of wealth building ideas to take advantage of the current market. In this book, 14 Top National Real Estate Educators share numerous strategies on how you can reap big or bigger profits with real estate, no matter the state of the economy. Now, you can learn from some of the best strategies available right in his book available on MrLandlord.com. Order your copy of this 300+ page book which sells for $22 in book stores. We've made special arrangements with the publisher to offer 100 copies of this book for less than HALF PRICE. Order now for only TEN dollars plus $2 shipping. Your total price only $12. One real estate investing idea is worth more than one hundred times that amount.